Adelaide Entertainment Centre, Fri 14 Oct. Bold and bubbly, with a huge dose of camped-up corn, Hairspray is an evening of in-your-face dance-pop in supersized proportions. The story of Tracy Turnblad, a “pleasantly plump’ sixties teen who loves to dance, becomes an unlikely ‘star’ on a local TV dance show and uses her newfound celebrity to demand the show allow black kids to dance alongside their white pals. The story is brought to life in a huge way with over 600 of Adelaide’s brightest young dancing talents lending their collective mass to an already over-the-top production. Presented by Brisbane’s Harvest Rain Theatre Company, this show hosts some big names in Australian entertainment – Simon Burke, Tim Campbell and Christine Anu, all of whom lend considerable ‘weight’ to their roles. Lauren McKenna is amply qualified for the role of the plus-sized Tracy, able to sing and dance up a storm yet also harnesses the awkwardness of youth that makes the character so endearing to Hairspray fans. As Tracy’s mother, the agoraphobic Edna Turnblad, Burke continues the tradition of the role being played by a man. He injects just enough attempts at femininity to ensure the character is both comical and loveable at the same time. Teaming with multi-award winning cabaret and musical theatre performer Wayne Scott Kermond as the delightfully optimistic Wilbur Turnblad provided a real highlight in Act Two where both performers hammed it up for the audience. Intimacy is nigh impossible in an arena spectacular however Edna and Wilbur’s duet (You’re) Timeless To Me came close, their antics managing to bridge that great audience divide with a mix of physical gags and local references that struck just the right chord. As rhyming R&B queen Motormouth Maybelle, Anu is loud and proud, while Tim Campbell literally sparkles as Corny Collins, the dance show ‘host with the most’. Both artists clearly understood their roles and delivered strong performances. In the role of villainous TV producer Velma von Tussle, Ruby Clark is splendidly nasty, her exaggerated spitefulness almost too much at times. Mean girl daughter Amber von Tussle was well played by Stacey De Waard, and Dan Venz was suitably earnest as teen heartthrob and Amber/Tracy love interest, Link Larkin. In other supporting roles Barry Conrad and Vidya Makan made the most of their roles as Motormouth Maybelle’s children, Seaweed and Little Inez, growing up as black teens in white 1960s Baltimore. Special mention goes to Emily Monsma who managed to dominate her every scene as the geeky, repressed but entirely loveable best friend, Penny Pingleton. Staging was a huge runway-like platform structure of varied heights and worked reasonably well, the design allowing for enough floor space to accommodate those aforementioned multitudes. Lighting was used effectively, particularly in the use of spots to draw the eye back to the actor of the moment – there is so much going on throughout this production, it’s easy to get lost among the action. The Adelaide production is missing the super large multi projection screens of the interstate performances – the narrow strip of screen across the rear of the Entertainment Centre stage didn’t really provide the same ‘spectacular’ environment the production promised. Sound was an issue throughout the night as well – both in terms of voice levels and misbehaving mikes. Many times I found myself waiting for something more to happen, the sparks seeming to fizzle out before hitting any great heights for me. 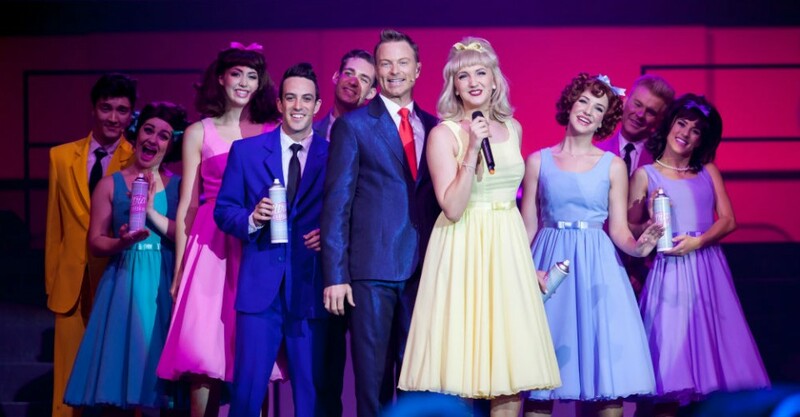 In short, although Hairspray is a fast and frenzied mix of dance, sixties pop and R&B sound delivered in a cute cartoonish setting, it absolutely relied on the strength of numbers alone, to make it ‘spectacular’. 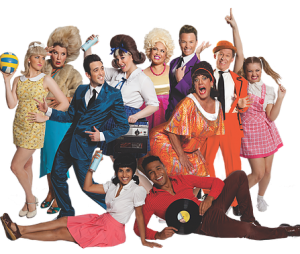 Hairspray – The Big Fat Musical Spectacular continues at Adelaide Entertainment Centre at 2pm & 7.30pm until Sat 15 Oct.
Book at Ticketek at ticketek.com.au and 132 849. Click HERE to purchase your tickets.